Sox manager Bill Carrigan had his man didn't use him in a game for three months, and then only to face six batters in 1 1/3 innings in one appearance. What he may have been saving him for is uncertain. It's not as though the Red Sox were in a pennant race. They were destined for last place again. As of the end of August, they were already 49 games out of first place and in no position even to challenge the seventh-place St. Louis Browns, who ranked 10 games above them in the American League standings. Why not see what Bushey had? Actually, what the team had done was to option Bushey to the Lewiston (Maine) Twins in the New England League. He started on July 28, the day he arrived, and threw a 3-2 five-hit, complete-game win over Portland. He pitched in eight games, with a record of 3-2.2 On September 10, he was one of five players the Red Sox recalled from the minor leagues. He was due to start against the St. Louis Browns but the game was rained out, earning Bushey the nickname "Rainy Day." The only game Carrigan used him was on September 17. The Sox were at home and the Tigers were in town. Detroit took two games that day,8-4, and 11-5. Bushey was the third of five pitchers in the second game. He gave up two hits and walked two, and was charged with one run in the 1 1/3 innings he pitched, recording the last out in the sixth and all three outs in the seventh. With the pitcher due up to bat in the bottom of the seventh, he was removed for a pinch hitter. Francis Bushey considered his nationality to be "mostly French. "4 He went through the Wheaton public schools and Wheaton High School. 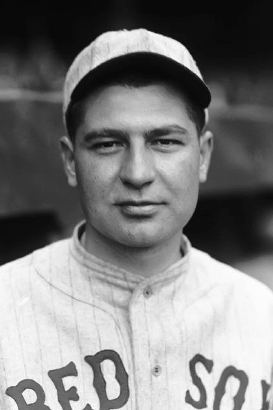 Frank then attended St. Mary's College (at St. Mary's, Kansas, also in Pottawatomie County) for four years and during his tenure there won 39 games, one of them a no-hitter.5He was also captain of the basketball team in his senior year. He'd almost certainly been signed by Red Sox scout Steve O'Rourke, who resided in St. Mary's, Kansas. Bushey was one of 16 pitchers the Red Sox brought to spring training in Bradenton in the spring of 1928. They wanted him to get more work in the minors and on March 31 assigned him to the Pittsfield Hillies of the Eastern League. He was 0-1 in four games for Pittsfield, and then found himself back in the New England League again, a Class B league as opposed to the Class A Eastern League. He wasn't at his best in the July 2 game against Haverhill, though he won the game, 17-8. Bushey homered and drove in five runs himself. By Late July, he was with the Brockton team, also in the New England League. He won his own game with a 10th-inning single on July 23 in a game at Lynn, winning 2-1. Bushey had doubled back in the third inning, driving in Brockton's other run. By season's end, he was 12-10 (2.76) combined for the two New England League teams. That earned him an invitation back to Bradenton in the spring of 1929. He was placed back with Pittsfield, released to the Hillies at almost the last minute, on April 12. He spent all of 1929 under manager Shano Collins with Pittsfield and put up a record of 12-5 in 48 games, though with a high (5.12) earned run average. His first game for Boston came on July 7, working three innings of one-hit relief at Fenway Park against the visiting Washington Senators. In all, Bushey appeared in 11 games, all in relief, every one a Red Sox loss. His record was 0-1, with a 6.30 ERA. He was often used in late-inning mop-up situations; five of the losses were games in which the opposition scored 10 or more runs. On September 12 he took the 5-4 loss, giving up the winning run-in 2 1/3 innings. He'd walked the first batter, seen the runner sacrificed to second, and then watched a grounder roll off shortstop Rabbit Warstler's arm (he was not assessed an error) into left field, allowing the tie-breaking run to score. He returned to Kansas and married a woman from Wheaton, Mary Catharine Cunningham, on June 10, 1936.7 He was managing a retail grocery store in St. Mary's, Kansas, at the time of the 1940 census. Frank and Mary had three young children at the time – Julia Ann (2), Robert (1), and James (two months). Later he owned a retail establishment, Bushey’s Liquor Store. He suffered a stroke in 1963, but ultimately died of cancer on March 18, 1972, in Topeka, shortly after retiring. He is buried at St. Mary's. In addition to the sources noted in this biography, the author also accessed Bushey's player file and player questionnaire from the National Baseball Hall of Fame, the Encyclopedia of Minor League Baseball, Retrosheet.org, Baseball-Reference.com, and the SABR Minor Leagues Database, accessed online at Baseball-Reference.com. Thanks to Rod Nelson for information regarding Steve O'Rourke. 1 Boston Herald, June 15, 1927. 2 Boston Herald, September 11, 1927. 3 Unidentified and undated clipping located in Bushey's Hall of Fame player file. 4 Frank Bushey player questionnaire from the National Baseball Hall of Fame. 5 Unidentified clipping datelined May 23, located in Bushey's Hall of Fame player file. 6 Boston Globe, February 12, 1930. 7 He remembered it as 1937 in his player questionnaire.